Peter and John ran to the sepulcher. They saw the physical signs of the Resurrection. The tomb was open, the stone rolled away, the linen clothes folded. But, they did not see the angels or the risen Lord. They hadn’t believed the women’s witness. Cleopas and his friend heard the women’s account that morning. They heard Peter and John’s report. They talked about these unusual circumstances as they walked to Emmaus. Jesus appeared in a different form to Cleopas and his friend. Their eyes were “holden” or restrained. Since Cleopas and friend were discussing the matter, were they more open and receptive to truth even though they’d felt astonished by the news they hadn’t believed? Was this why Jesus came to them and taught them? Were their eyes restrained until they finally believed? So, basically, were they holding themselves back from divine manifestation? When Jesus appeared, His apostles still could not believe it was Him. They were “terrified and affrighted.” Jesus asked them to touch His hands and feet. They ate together. He said the prophecies were fulfilled. How long did this experience evolve? Did it take hours for their hearts to be ready to believe, even though they were looking at Him?! I’ve thought a lot about these amazing people and this learning experience. Did their grief cloud their faith? Was their faith shaken altogether so they couldn’t believe in a miracle regardless of how much they wanted it to be true? Did fear about their own safety outweigh hope? Did cultural tradition and expectation block their capacity to receive revelation? Mary Magdalene recognized Jesus with a word. Cleopas and friend felt their hearts burn within them, leading to their epiphany. The others touched, ate with, and heard before they were convinced. Where am I on this scale? Do I miss the angels in plain sight at the tomb because of my preconceived notions and limiting beliefs? Do I walk past the Savior on the road because my eyes are holden? Do I believe the witnesses sent to strengthen my faith? In contrast, the people in America reacted differently. In the midst of darkness, they heard a voice from heaven. The voice declared that He was Jesus Christ. He bemoaned the fallen and cried for the unrepentant. At a later date, Jesus appeared to Nephites gathered at the temple. Initially, they heard a voice. They couldn’t understand it. They heard the voice again. They still couldn’t understand it. Finally, the third time, they opened their ears to hear and looked towards the voice. They understood the voice. It was the voice of the Father introducing His Beloved Son!! They tuned in and heard the most Glorious voice in the universe speaking to them! But it required an effort on their part, a commitment. They wanted to understand the voice. They strained and stretched to understand the voice. And everyone who made the effort, heard. They spent the night inviting everyone to gather with them to meet the Savior. People believed them, and with great effort gathered in huge multitudes. Jesus came to them again and ministered unto them. He never chastised their lack of faith. He didn’t have to. They believed Him. The effects of that faith overwhelm me as I read what Jesus says as He prays to the Father for them. Everything He prayed referenced the Nephites’ belief in Him. “Father, I thank thee that thou hast given the Holy Ghost unto these whom I have chosen; and it is because of their belief in me that I have chosen them out of the world. Father, I pray that thou wilt give the Holy Ghost unto all them that shall believe in their words. Father, thou hast given them the Holy Ghost because they believe in me; and thou seest that they believe in me because thou hearest them…. Others had the same possibilities. However, their eyes were holden. Their ears were stopped. Unbelief filled some part of their soul. They did not see or hear or know things Jesus would have willingly shown and told and taught them. And what about us today? Are we still living far below our privileges and revelatory opportunities? 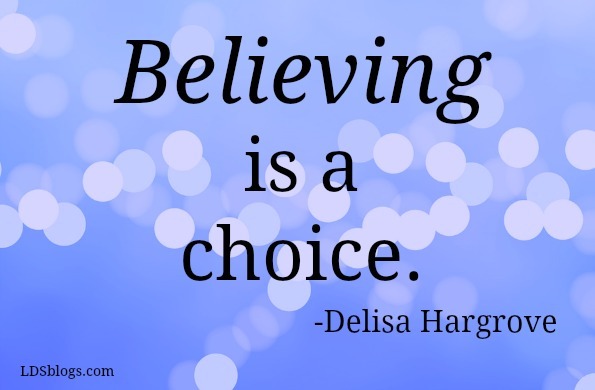 Believing is a choice. Believing also compels to action—to make whatever effort it takes to hear and see and know. Every day I have the opportunity to tune my heart to Him. He promises “draw near unto me and I will draw near unto you; seek me diligently and ye shall find me; ask, and ye shall receive; knock, and it shall be opened unto you.” Such a beautiful gift for simply believing. A good reminder to continually ask “What more will ye have me do?” Praying that I will believe and recognize my Savior daily.